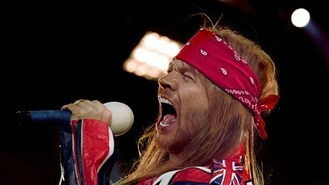 The Sweet Child O' Mine rockers, who are fronted by Axl Rose, will hit the road in May, reports NME.com. The band will perform at Nottingham's Capital FM Arena on May 19 and will then play shows in Liverpool, Newcastle, Glasgow, Birmingham and Manchester before wrapping up with a gig at London's O2 Arena on May 31. Guns N' Roses last performed together in the UK in 2010. They released their most recent album, Chinese Democracy, in 2008 and are currently said to be working on new material. The original members of the band - including former guitarist Slash - are due to appear together on the same stage in April as the band is inducted into the US Rock and Roll Hall Of Fame, although Slash played down rumours they would be performing together. "I know that there's a lot of rumour about it, as always when it comes to GNR, out there on the internet and stuff, but as it stands right this second, I have no idea what's going on," he told Washington D.C. rock radio station DC101.